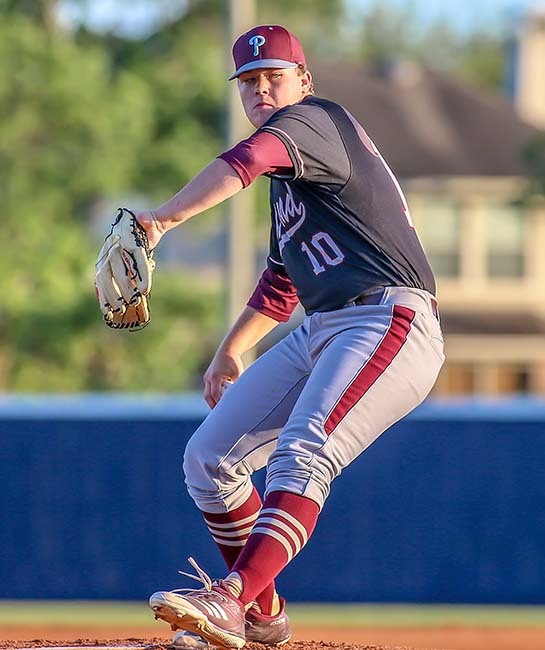 PEARLAND — The playoffs continue and there is only one area team left as the Pearland Oilers swept the Friendswood Mustangs in the 6A Region III baseball bi-district best-of-three series. The first game was a real battle as the Mustangs built a 6-1 lead over the Oilers and it appeared they would register the win. However, that's why they play seven innings. As Yogi Berra used to say, "It ain't over till it's over." Friendswood scored a run in the top of the first inning and Pearland matched it in their half of the inning to tie the score at 1-1. The Mustangs added a pair of runs in the third and three more in the fourth for a 6-1 advantage. The Oilers answered in their half of the fourth with a run to cut the lead to 6-2 and then they started their comeback with a run in the fifth and sixth innings making the score 6-4. Down to three outs in the bottom of the seventh, Pearland completed their rally to score three runs to pull out a 7-6 win thanks to a walk off single by Mason Lytile. Trailing 6-5 in the bottom of the seventh inning, Lytile singled on a 1-1 count, scoring two runs to give Pearland the one-run victory. Pearland's three-run rally in the seventh began with singles by Carter Allen and Shawn Huber before Izayah Quezada put down a sacrifice bunt. Matt Adams then walked to load the bases before Clayton Broeder struck out. That brought up Oiler shortstop Parker DeLeon who was down to his last strike before coaxing a walk which forced in a run for a 6-5 score. Lytle then delivered his clutch hit to complete the comeback. One of the highlights for Pearland was a 400-foot home run by Clayton Broeder who also threw four innings in relief out of the bullpen to pick up the win. "He (Broeder) had to have hit that 400 feet," Pearland head coach Anthony Scalise said. "We got some clutch hits, and Broeder did a good job coming in pitching. "To be honest, we came in here struggling offensively, defensively, and even on the mound where we've been really, really good all year. The last couple of outings, we've just been mediocre. "The kids just kept battling tonight. Offensively, our approach was pretty good, and this win really gets some momentum on our side. We needed it. We're young, and we've had some tough losses." In Game 2 of the best-of-three series, Pearland made sure they wouldn't need a last inning rally to eliminate the Friendswood Mustangs. Pearland outhit Friendswood 10 to 5 and outscored the Mustangs 11-4 to win the series to advance to the next round of the baseball playoffs. The Oilers scored a run in the top of the first and then exploded for five runs in the second for a quick 6-0 lead. Two more runs were scored by the Oilers in the fifth for an 8-0 advantage and then the 'Stangs erupted for four runs in their half of the fifth to cut the margin in half 8-4, but that is as close as the game would get. The Oilers added three insurance in the seventh to close out the game 11-4. Pearland shortstop Parker DeLeon came alive at the plate for the Oilers when he went 4-for-4, tripled twice and drove in five runs to set the pace for the Oilers offense and the win. Colby Casey was the winning pitcher as he went four and a third innings, allowing four runs on three hits and striking out eight. Mason Lytle and R. J. Patrick entered the game out of the bullpen and helped to close out the game in relief. Lytle recorded the last seven outs to earn the save for the Oilers. Pearland racked up ten hits as DeLeon, Lytle, and Clayton Broeder all collected multiple hits.